All the latest goodness has been pushed to ishizeno.com. Here is an intriguing idea: what if the two touchscreen displays were mounted on a folding panel? An horizontal hinge could be located just below the 8 knobs, alowing the screens and the kobs to be raised at an angle. A simple locking mechanism would be used to keep the display panel locked during transport, while another one would keep it raised and sturdy during use. This arrangement would have two main benefits: first, it would improve readability of the screens; second, because the backplane holding our 4 Parallella boards will be attached directly to the back of the screens, it would dramatically improve heat dissipation when the display panel is raised. This second benefit is really what sold me on the idea, because the boards can be hot, especially if we upgrade to the 64-core version down the road. Here is an updated design, adding 12 mm in length and 11 mm in width. Final tally: 351 mm × 268 mm. And with the extra space, we added one more column of switches and some space around the transport controls. The new column allows us to add one switch per stereo channel (labeled A through H), as well as Sel, Mix, Seq, and Syn switches. Last but not least, it allows us to have a much nicer layout for the arrow switches. As far as the physical UI is concerned, I think we’re done. 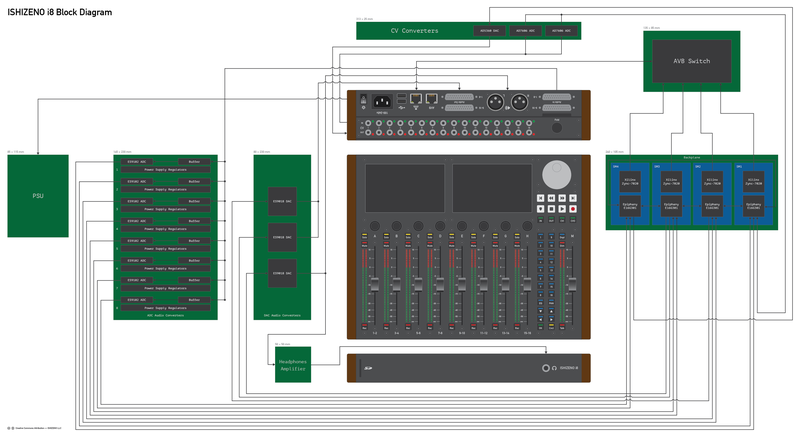 Here is an updated block diagram reflecting the new layout. Most importantly, it shows the new dimensions for most of our printed circuit boards. At this point, I am fairly confident that we will have enough real-estate for the ADC and DAC boards, which was cause for concern with the previous design. Also, I have left 25 mm of clearance on the back of the chassis for the PCB on which all backplate connectors will be mounted, separately from the ADC and DAC boards. This should make it a bit easier to develop everything in parallel. It should also be noted that the backplane is much smaller now. It will sit right underneath the two touchscreen displays and will host our 4 Parallella modules and our 8 rotary encoders. It might even share some mounting hardware with the displays in order to save some space. So, we want two 100-LED bargraphs per stereo channel. That means 200 LEDs to drive, and we only have 104 mm × 13 mm of PCB space to achieve this feat of engineering. How do we go about that? But there is a solution: a companion board mounted vertically, with LM3914 devices on each side. And which interconnect would we use for that? A vertical SO-DIMM connector of course? Wouldn’t that waste a ton of vertical space? Not really, because we already use 21 mm for the faders. What you have on this mockup is our best iteration so far. This is the result of working on the mechanical aspect of things, trying to make sure that all the pieces could fit together. In our previous design, they could not, so we moved things around, and broke free from the MacBook Pro’s footprint by a few centimeters. Our new footprint is 339 mm × 257 mm, while the MacBook’s is 314 mm × 219 mm. Therefore, we’ve added 25 mm one way, and 38 mm the other, but these few centimeters are making a world of difference. 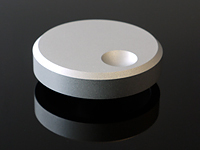 First, it allowed us to ensure that we could actually fit our 100 mm motorized faders. Things would have been a lot easier should we have opted for the much more reasonable 60 mm version, but these are not considered professional, so we decided to bite the bullet and add about an inch of width. Then, we made sure that we could properly fit all the mounting hardware for our touchscreens and printed circuit boards. This resulted into a much more open design that allowed us to add a few more switches that should turn out to be quite useful. In order to reduce the volume occupied by our faders, we’ve decided to switch to the ALPS RSA0N11M9A0K. They are a lot smaller than the PGFM9000, and should be quite a bit cheaper as well. The only problem with motorized faders of any brand is the limited durability. In the case of the ALPS model, it’s just 30,000 cycles, which means that such components need to be replaced on a regular basis. 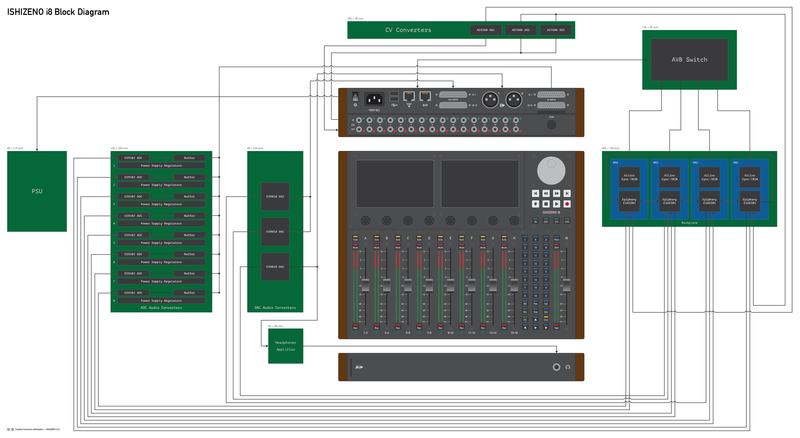 For this reason, our system will ship with a full set of 9 replacement faders. Second, the extra width allowed us to adopt a much more conventional layout for our transport controls (top right). Underneath them, we added an horizontal row of four illuminated buttons for switching between modes: Audio Inputs, Audio Outputs, CV Intputs, and CV Outputs. Switching between modes will change what is displayed on the touchscreens and what can be monitored on the bargraphs. The default mode will be Audio Outputs. Third, talking about the bargraphs, we’ve concluded that we should build our own using regular SMD LEDs, instead of pre-built devices. This will allow us to reduce the size of the bargraphs to the absolute minimum, while combining on the same printed circuit board other components like switches. We could use an 0603 LED like the Kingbright APHB1608ZGSURKC, which measures 1.6 × 0.8 mm, and provides both green and red illumination. With these dimensions, we could stick to 64 levels, or go all the way to 100, which is what we will attempt. Now, we need to figure out the best way to drive these bargraphs while using as few GPIO pins on the submodules as possible. One option would be to use the LM3914, which supports multi-colored LEDs, and can be cascaded to drive up to 100 steps. As far as I can tell, this is a perfectly viable option. Fourth, instead of having a single bargraph per stereo channel, we’ve decided to go for two, giving us one bargraph per mono channel. This is positively insane, but it’s the kind of sizzle that would automatically tell a newcomer that something quite unique is going on here. The challenge there will be to drive these 200 LEDs per channel (1,800 LEDs in total), while having to deal with stringent volumetric constraints. I have no idea whether this is feasible or not, but we’re going to give it a shot. Fifth, we’ve used the extra available length to fit two columns of twelve switches organized in four main groups: first, 16 switches numbered 1 through 16 and corresponding to the 16 inputs and 16 outputs that we have for both audio and CV signals; second, EQ and Pan switches, allowing you to switch to equalizer or pan mode without having to navigate through some complex menu; third, four navigation arrows that can be used to control your DAW; fourth, a pair of OK and Cancel switches that can be used to control some modal dialogs. On that front, we clearly learned a few things from the Avid Pro Tools | S3 and the Avid Artist Mix. Thank you Avid! Sixth, the Solo, Mute and Rec switches have been replaced by Dspl, Dim, and Talk switches in the master fader section. Some of this was inspired by the Rupert Neve 5060 Centerpiece: Dim will let you dim the output to your headphones or monitors, while talk will let you insert talkback on some of the channels. 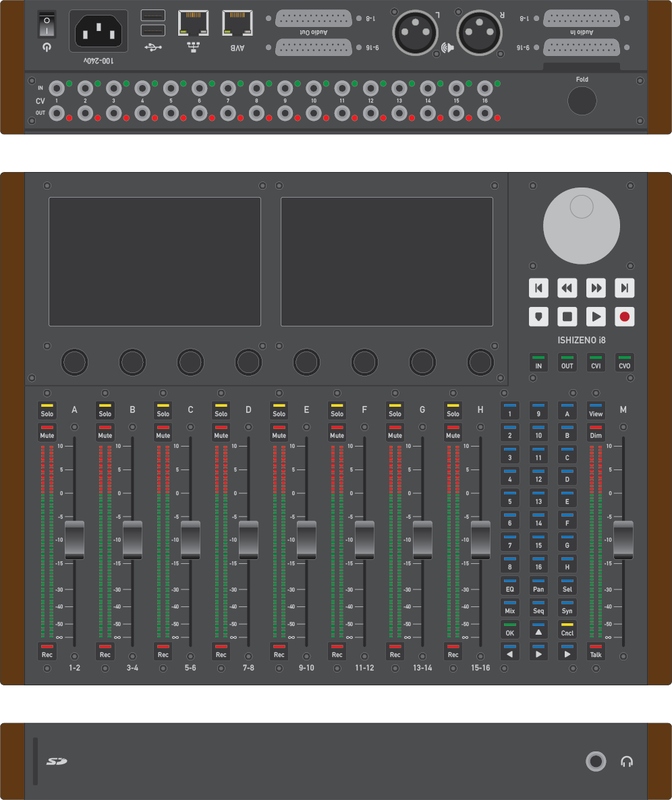 For that feature, we will need to add some basic microphone, but we can work on that a bit later. Dspl stands for Display and will let you toggle the two touchscreens between the four Parallella boards. This will require that we use two AD8191 4:1 HDMI switches. Switching will be done in the following sequence: 1 & 2, 1 & 3, 1 & 4, 2 & 3, 2 & 4, 3 & 4. Seventh, now that we have 16 bargraphs, we can use one bargraph per signal within a given mode (In, Out, CVI, CVO). Combined with the 4 mode selection switches and the 16 signal selection switches, this makes for a very complete and very intuitive user interface, without having to rely on the touchscreens. As a result, we will be able to use the touchscreens for the more advanced operations related to synthesis, recording, or mixing. Eigth, we also took advantage of the extra length to add one more RJ45 port on the backplate. This is due to the fact that the awesome MOTU AVB Switch gives us not only 5 AVB ports, but also a regular Gigabit Ethernet port to connect to an external network. Therefore, we can use 4 of the 5 AVB ports to connect our 4 Parallella board, and the fifth one to connect to an external AVB device. Ninth, we removed the 3mm TRS jack on the frontplate, because it was overkill, and definitely not professional. And we mounted the SD card reader vertically so that we could leave the entire base of the enclosure for the PSU, ADC, DAC, amplifier, and switch boards. With these changes, we should be able to fit everything we need.